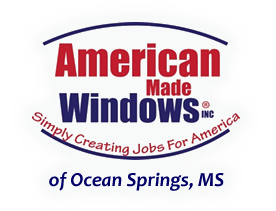 American Made Windows manufactures all windows right here in the USA, providing jobs for Americans and a quality product for homeowners. A composite of three windows (casement, double hung or picture windows) usually made up of a large center unit and two flanking units at 30, 45 or 90-degree angles to the wall. A molding or stop placed around a window frame to hold the glass in place by pressure. A composite of four or more window units in a radial or bow formation at a 10 or 15-degree angle. Non-venting or non-operable window. Also known as a picture window. Laminated glass is used in most blast-resistant and hurricane-resistant glazing. This type of glass is composed of a glass “sandwich” of two bonded plates of glass with a plastic interlayer between them. Laminated glass may fracture, but fragments remain bonded to the interlayer and in place inside the window if properly glazed. A handle or grip that is applied or is an integral part of the bottom rail of the lower sash (top rail of the upper sash) of a double-hung window to make it easier to raise or lower the sash. Any small bar that divides a window’s glass. Also called a grille or windowpane divider. pounds per square foot – a measurement of air pressure used in window testing, e.g., 1.56 psf (25 mph) or 6.24 psf (50 mph). A single assembly of stiles and rails made into a frame for holding the glass. In double-hung windows, the rope or chain which attaches the sash to the counterbalance. A door in which the operating panel slides sideways within the master frame. Each operating panel has rollers to permit easy operation. Also called a patio door. Usually used in applications where passage to exterior patios is required while providing weather resistance and security. Not to be confused with mall or entrance sliding doors which provide security, but little or no weather resistance. Also called a sliding glass door. The process of providing a net heat gain within a structure, over and above the normal heat loss, by the passive collection of the sun’s heat through windows and other glazed areas. The addition of a thermally insulating material between two thermally conductive materials. The rate of heat flow-value through the complete heat barrier, from room air to outside air. The lower the U-value, the better the insulating value. This is a better tool to use when comparing window insulating performance. The description of the way a window operates, e.g., hung, sliding, casement, etc. Since “O” indicates the fixed sash, this is a window in which the left sash slides and right sash is fixed, looking from the outside in. Since “X” indicates the moving sash, this is a window in which both sash operate.